Mountain Tech is NOT a "junkyard". 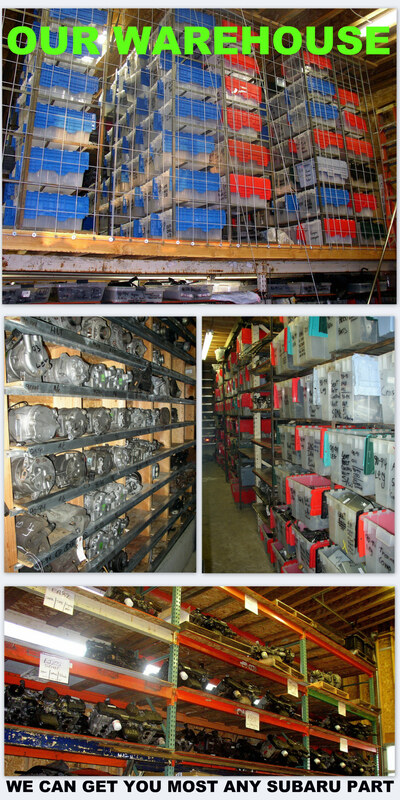 Mountain Tech is an exclusive used Subaru parts provider for over 30 years. All parts are pulled off the car already. Most all used parts are stored inside. Everything is classified in a very specific Subaru way. We only save parts that are low mile and tested good. We do not cut any wire harness. Since we are on the west coast, we do not have rusty parts. We ship all used Subaru parts out same day in most cases. Since we have a very extensive knowledge of the Subarus, We are able to locate the exact part you need quickly. Mountain Tech carries most of the smaller parts, that in a "junk-yard" you would have to buy a complete assembly. We have many older used and new Subaru parts to restore you vintage 1978 and later Subie. Check out our Legacy and Outback, Impreza, Forester, Loyale, EA81, and Subaru wheel sections.